For this swap you will have 2 Partners! 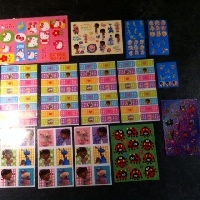 You will Send 5 Random Sticker Sheets But No Teacher or Reward Stickers These Must Be Full Sheets! Please Do Not Send Anything Dirty or That Smells like Smoke! Must have a 4.95 or Higher But Newbie Friendly With A Well Filled Out Profile! I’ll Be Checking Profiles And I have the right to Ban Please No Flakers! I can Angel If Need Be!